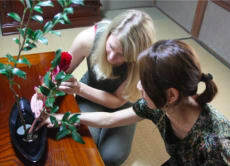 I joined Sogetu School in 1999 and have learned both old art ikebana and contemporary flower arrangement. I arrange flowers for gifts, weddings and Japanese traditional scenes. I’m enjoying connecting with people thorough flowers.